On June 30, 2014, Loic opened up his Dyeworks shop to allow Neopians to change the color of popular NC Mall items. You'll need one of his potions and the NC item in question to get started. Purchasing any of the bundles will deposit the number of Hue Brew Potions in the bundle directly in you inventory. For example, purchasing the 20-Bundle will fill your inventory with 20 individual Dyeworks Hue Brew Potions. 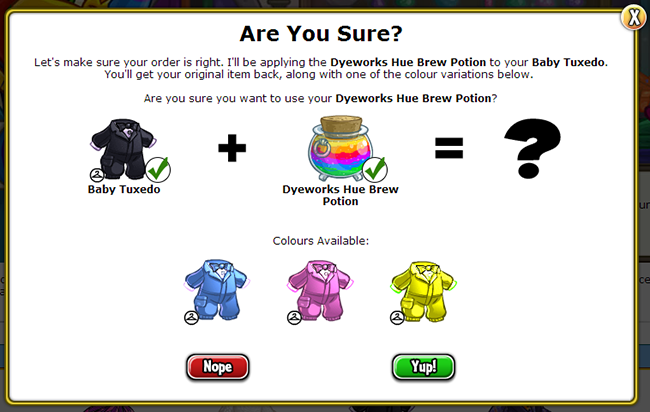 After clicking "Yup", you'll see a success message and your new item will take the place of the dyeworks potion in your inventory! The item you receive will be randomly selected for you. You cannot choose which color item you'll receive! You will also get to keep the original item, so no worries about losing older NC items! The newly dyed item is also just like a normal NC item: you can trade it, wear it, place it in galleries, etc. The Advent Calendar has given out special edition Hue Brew potions on three occasions. These potions have a festive holiday design, and can be used just like the original Dyeworks Hue Brew Potion. These items are available for a limited time, until May 3, 2019. These items do not have retirement dates at this time.